Tucson-based HVAC contractor D&H AC and HVAC manufacturer Daikin will donate close to $10,000 to the National MS Society for the 25th Annual Walk MS to take place in Tucson on 3/17/2018. 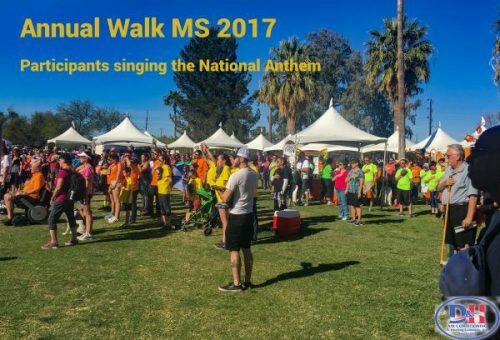 Tucson, AZ – March 12, 2018 – While raising awareness for a cure for MS is the focus of the 25th Annual Walk MS organized in Tucson by the National MS Society, the donation platter stops again this year at the door of corporate donors. And just like last year, D&H Air Conditioning & Heating (www.dandhac.com) is stepping up to the plate for the cause. For the Tucson-based HVAC contractor, the cause is not theoretical but personal: Jackie, the wife of a long-time employee, has been diagnosed with MS in 2009. Always the fighter, Jackie has been an active volunteer for the cause ever since she received news about her medical condition. But today, some 9 years into her ordeal, she is seeing her health decline, more rapidly than before. While Jackie and her husband are looking at experimental treatments as possible alternatives to the predictable outcome of her illness, they both continue to volunteer for the National MS Society. And this year again, Randy knocked at the door of his employer on behalf of the Society. In turn, the President of D&H AC called the Houston-based headquarters of HVAC system manufacturer Daikin. And just like in 2017, Daikin agreed to donate a complete air conditioning system to the winner of an auction organized by the National MS Society in the course of the 25th Annual Walk MS event. D&H AC will donate the value of the engineering and installation labor. On March 17, the Daikin air conditioning system will go on the auction block. The highest bidder will receive a unit completely tailored by D&H AC for their home, and 100% of the auction proceeds will benefit the National MS Society. Just like last year, Jackie and her husband will make the 25th Annual Walk MS count to help those battling this illness. They both will be leading the ‘Jogging for Jackie’ team.